The last two years, I have focused only on Hello Kitty when having my nails designed professionally. I have decided that it was Pochacco's turn for this year. When October came around, I wasn't in a mood for Halloween nails, but to start a simple black and white style as an introduction to Pochacco. Here is my take on Pochacco. 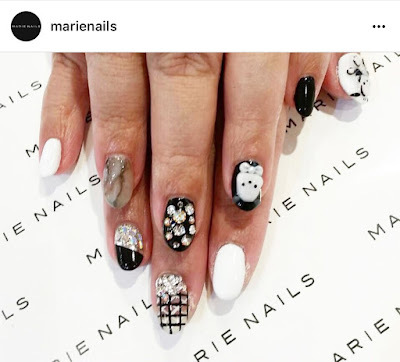 When I was browsing Instagram for nail design ideas, I figured that my theme would be black and white as Pochacco's face is like a white blob on the nail. Usually with a white center, you need to correlate it with a different color to create a nice contrast. Since last year's Hello Kitty Xmas lights nail design, I have been in love with the idea of adding rhinestones, pearls, or gems. For this nail design, I went for combining styles while adding a touch of simplicity. It's not too bad, right? I think my favorite has to be the middle finger with the criss cross pattern - along with Pochacco, of course. With a clear background, the black lines overlay the white lines, making it a nice style. Adding a bit of stones gives it a complete finish. My fascination with rhinestones carries over to this year's Christmas design. I loved last year's Christmas design so much that I wanted to replicate it, but with Pochacco as the character. I call it: Santa Baby Pochacco. 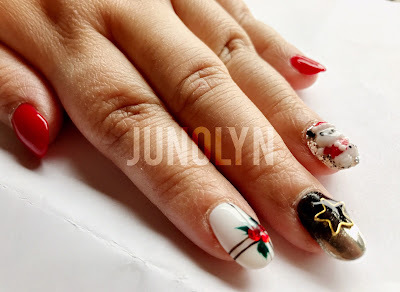 Since Pochacco was wearing a red Santa suit, I wanted my nail theme colors to be red and white again, but with an added touch of black. When I was choosing styles, I realized I could add one finger nail style as a stand alone center. Last year's design had the same star accessory and I wanted to keep it for this year's design. Below is a closer picture of it. Half silver chrome and the top half is black, with a star as the finishing touch. This nail style represents the New Year coming. After I had my X-mas nails done at Marie Nails, I think I was going for a more "busier" nail art. I have seen pictures of kawaii nail art in Japan and I never liked how most of it had too much art going on the design. I didn't want to go too simple as well. This is my version of how I like it -- in the middle. Not too simple, nor too extreme.